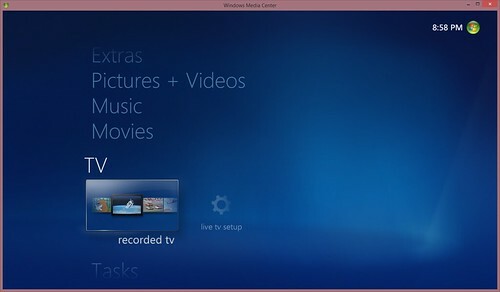 In 2007, I cut the cord and adopted Microsoft’s Windows Media Center on Windows Vista Ultimate. I purchased a Shuttle XPC small form factor computer for one TV and an Xbox 360 with its built-in Windows Media Center Extender for remote access on another TV. And so began my search for a Windows Media Center replacement. 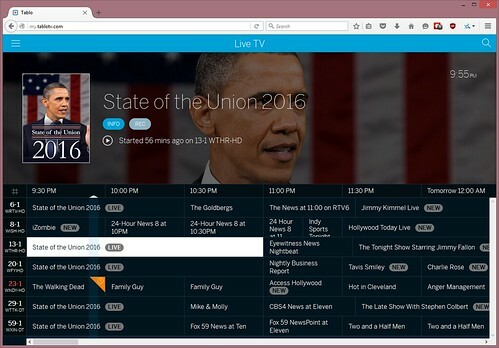 There are a lot of DVR/PVR options, several of which are open source or community developed. While Kodi (formerly XBMC) and Plex were leading contenders, ultimately Tablo offered the best experience. This post will document my recommended Tablo hardware and architecture for others to follow if interested. I live in a three-story town home that features an attic. My Tablo network is 100 percent wireless, making placement of wireless components and the use of two wireless frequencies an important part of my infrastructure. Lastly, my Tablo has its Max Recording Quality configured at the HD 1080 8 Mbps setting. At this setting, I have a good playback experience on both TVs at a resolution I desire — all via a wireless network. 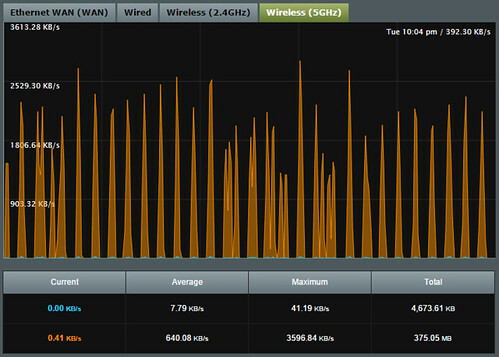 The ASUS RT-AC68U wireless router has both 2.4 GHz and 5 GHz concurrent bands (802.11 a/b/g/n/ac). The Tablo supports 802.11 a/b/g/n (no ac) while the Google Nexus Players support 802.11ac 2×2 (MIMO). I decided I wanted to split my wireless traffic, using the 2.4 GHz for the Tablo (better distance for attic) and the 5 GHz for the Google Nexus Players (shorter distance for floors 1 and 2). 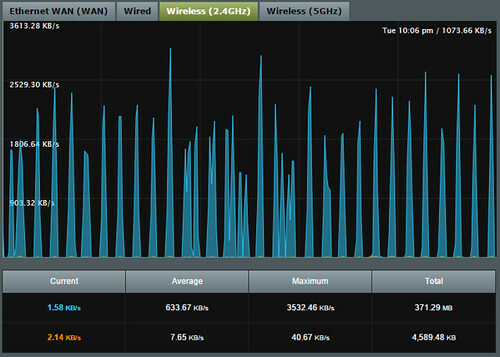 Putting the Tablo on 2.4 GHz and the Google Nexus Players on 5 GHz make nice use of two wireless networks. Tablo’s HD 1080 8 Mbps reportedly requires only 8 Mbps throughput to deliver 1080p quality. But since all of my devices are wireless, I need 8 Mbps from the Tablo to the wireless router plus 8 Mbps from the wireless router to each Google Nexus Player. Thankfully, this works great. 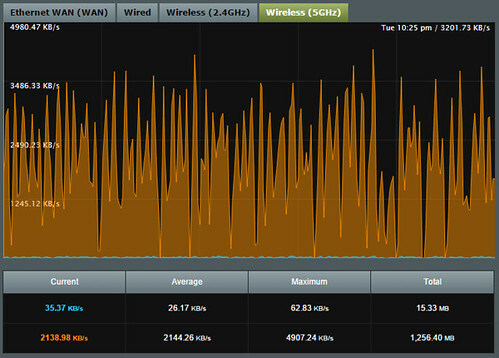 Here’s what the network traffic looks like. For a single Google Nexus Player (5 GHz) to stream content from the Tablo (2.4 GHz), my dual networks each require an average of less than 1 Mbps. Notice how the video stream is sent in short bursts (this demonstrates continuous playback). 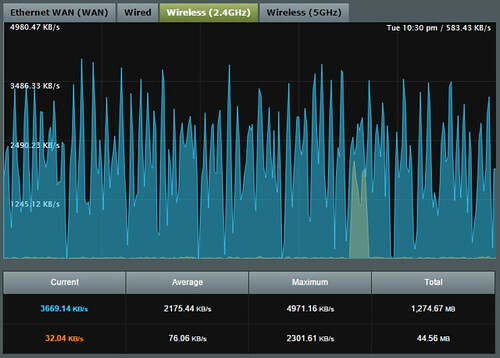 When using two Google Nexus Players (5 GHz) to stream content from the Tablo (2.4 GHz), my dual networks each require an average of 2 Mbps. Notice how there are fewer spaces of inactivity when two devices are playing video content. When I first bought the Tablo, I attempted to use my existing Rokus (gen 2), Google Chromcasts (gen 1), and Apple TVs (gen 1). Playback on all of these devices was riddled with issues, delays, and frustration. If I tested only these devices, I would have given up on the Tablo as a viable Windows Media Center Replacement. But there was hope. Playback via my iPhone, iPad, and laptop via a modern browser each offered an excellent experience. But none of these devices were the 10-foot on the couch experience. I eventually found the Google Nexus Player and wow what a difference it made. Instantly, nearly all of my hopes and dreams for the Tablo came true. Playback was snappy, reliable, and most importantly wife friendly. My recommendation is for you to visit the Tablo Community Forums before buying your supporting peripherals. While my architecture works great for me in January 2016, there may be other and better options several months from now. Optionally, feel free to share your Tablo architecture in the comments.